My guy and I love to get dressed up and go on dates. Recently, he told me about a new restaurant he wanted to try and we decided to make a night of it. This dress is so feminine and chic – and its quite simply the perfect dress for a special date. Its been hanging in the closet just begging to be worn for some time now and I gladly slipped into it for a romantic evening with my beau. He sweeps me off my feet in so many ways: whether its being supportive of my hectic schedule, making an emergency stop at my school with the book I desperately left behind or simply surprising me with a trip to Disneyland – he is the most adorable man in the world and I’m lucky to have found someone so sweet. I borrowed this darling gold necklace from Nicole, popped on a beautiful pair of tan flats and finished the look with my favorite bag from Forever21. They’ve really stepped it up lately – I’m finding it hard not to buy tons of their cute evening bags. This one reminds me of Chanel; its made of a faux velvet and its adorned with gold hardware. The strap is long, but sometimes I like to wear it as a clutch. 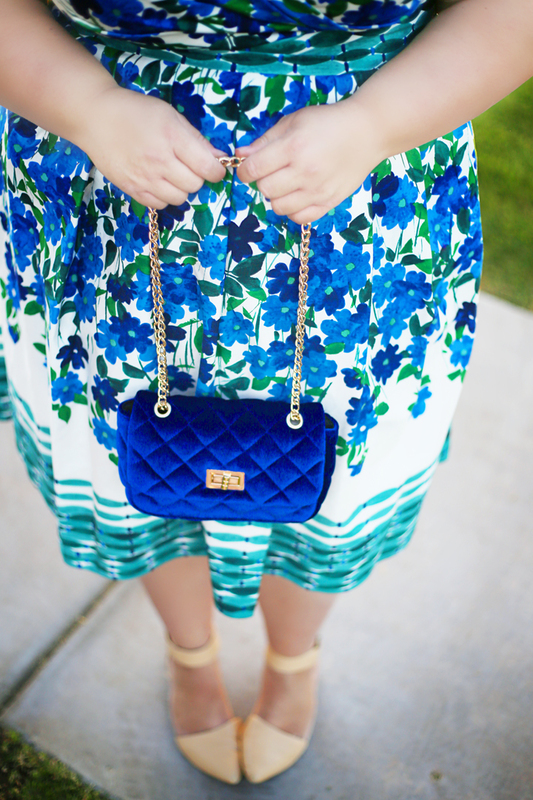 There is something dainty about wearing this bag sans-strap, don’t you think? Special thx to Nicole for the photos. Gorgeous dress and it looks great on you! 🙂 Hope you had a great date night!